EghtesadOnline: British Airways confirmed on August 23 that it would end its services to Iran, namely its five times weekly operation to Tehran’s Imam Khomeini International Airport, joining Air France and KLM which had both previously announced their withdrawal on their respective routes from Paris CDG and Amsterdam. While it was stated in various reports that the cessation of services was due to the growing weakness of the Iranian currency, UK-based weekly e-journal anna.aero decided to take a look behind the numbers to see if the routes were performing to the standards that these airlines would be expecting on long-haul routes. 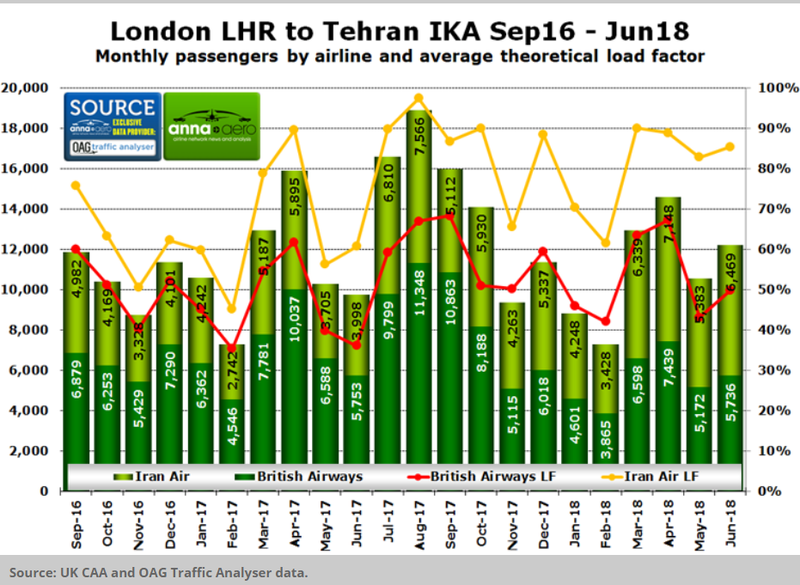 While Anna.aero was only able to obtain actual passenger numbers for the route between London Heathrow and Tehran, courtesy of the UK Civil Aviation Authority, it has used OAG Traffic Analyser data as a tool for forecasting the performance of Air France and KLM’s services. BA relaunched services between London Heathrow and Tehran’s Imam Khomeini International Airport on Sept. 1, 2016, with the carrier this summer presently operating five weekly flights using its fleet of 777-200s. BA is not the only airline on the route, with Iran Air operating a three times weekly service between the two airports using its fleet of A330-200s and A300s in S18, according to Financial Tribune. With BA offering more flights, it is not surprising that it has the largest share of passengers on the route, having an average share of monthly traffic between Heathrow and Tehran of 58%. However, during May and June this year, the UK flag carrier’s market share went below 50%, with Iran Air becoming the leading carrier for traffic on the route during the last two months. Looking at the total number of passengers flying on the route during H1 2018, passenger numbers fell 0.5% versus H1 2017, highlighting that the market has been stagnant. During the time it has been operating the route, based on the data obtained from CAA compared with OAG Traffic Analyser data, BA achieved an average theoretical load factor on its service to Tehran of 58%. 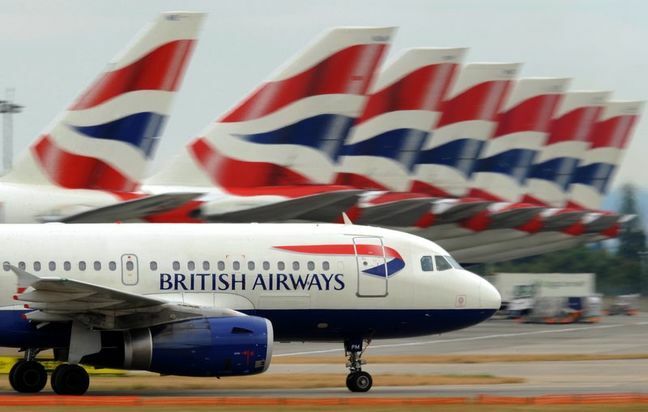 Not knowing the yields that the airline was getting on the route, based on load factor alone, this would be enough for BA to pull off the service, given that the airline flew 42.63 million passengers last year with an average recorded load factor of 82%, according to CAA statistics. During the same period, Iran Air reported an average load factor of just under 75%, fairing much better than the UK airline. Air France returned to Iran after an eight-year hiatus on April 17, 2016, launching a three times weekly A330-200-operated service. At the time, it was the only operator on the airport pair, but later that year Mahan Air introduced its own services, while on March 27 this year Iran Air entered the market too, beginning a twice-weekly operation. Since 30 July this year, Air France has scaled back its Tehran route from CDG to just a weekly (Mondays) rotation using A340-300s, using its JOON brand on the sector. Unlike BA, Air France appeared to be doing well on its Tehran route, boasting a healthy 93% load factor, while Mahan Air, since its launch, has reported an average theoretical load factor of 59%, with Iran Air delivering a 78% result for its first three months of full operation. One factor, which may have resulted in Air France wanting to withdraw from the market, is due to the fact that its average fare reduced by 6.1% during H1 2018 based on OAG data, while at the same time it was using older and more costly aircraft to operate the route. When investigating airfares, it shows that the average fare in H1 2018 was €341.50, while in H1 2017 it was €363.83. With OAG traffic data also suggesting that Air France was not getting high loads in its premium product to Tehran, this could have further escalated the reason for withdrawing. Like Air France and BA, KLM made a return to the Iranian market in 2016 when it launched a four times weekly service between Amsterdam and Tehran in October that year. Data suggest that KLM was the star performer between its home base and Iran, with it reporting an average theoretical load factor between the two cities of 85%, much greater than the 73% recorded by Iran Air during the same period between November 2016 and June 2018. However, unlike the Paris-to-Tehran market, which remained stagnant in H1 2018, numbers show that the market between Amsterdam and the Iranian capital fell by nearly 23% during the first six months of this year, dropping from 87,200 in H1 2017 to 67,350 in H1 2018. As a result of the number of passengers falling on the route between Amsterdam and the Iranian capital, it is not surprising that revenue management at KLM increased the average airfare between the two cities. Data show that during H1 2018, KLM’s average one-way airfare between Amsterdam and Tehran was €258.17, up 29% from €199.83 in H1 2017. However, this fare is much lower than the ticket prices being offered by fellow group member Air France. Despite this, calculations suggest that even with the hike in the average airfare between Amsterdam and Tehran in H1 2018, the revenue on the route should have increased by 11%, even with the lower level of passengers. Of course, this is only based on sales of point-to-point traffic, with OAG Traffic Analyser data suggesting that 78% of passengers flown by KLM to/from Tehran in H1 2018 would have connected onto another service at Amsterdam. With yields on point-to-point services usually higher than on connecting tickets, it means that the overall revenue increase for H1 2018 is likely to be below 11%.